Over time, the audience grew and became more than our “readers”; they became family. Frequent commenters would be sought out whenever we travelled outside Spain, and often, that initial meeting would turn into a longterm friendship. Our readers kept us going. Our friends were the ones that pushed us to write about the peninsula even when we felt burnt out. “You can’t stop!” they would say, “We love learning about cured ham, Portuguese goat cheeses and Sherry wine!” And as quickly as the desire to quit blogging filled our hearts, the counter desire to share more of our passionate experiences persisted. As a result, our audience kept coming back. They say it takes a community to raise a child. I would equally say that it takes a community to support a blog. In 2008, we brought 30+ bloggers from 11 different countries to Rioja to experience a touch of Spain, to feel the passion we felt for the peninsula, to understand why we’ve chosen to dedicated our lives to its stories. Like us, they were blown away by its unrivaled beauty, its diverse gastronomy and its vibrant and passionate culture; so much so that they expressed a desire to come back. The activity of wine blogging, as well as Catavino, has come a long way since we first brought wine bloggers to Spain 6 years ago. People tend to share their thoughts on Facebook and Twitter more than the article itself. Thousands of people have created wine blogs internationally, many offered in more than one language. And while we were still trying to build a profile for Spain and Portugal in 2008, today these countries are firmly established in the mind of wine consumers around the world. This is why we’re excited for Catavino to co-host the EWBC: Digital Wine Communications Conference in Rioja again this year. 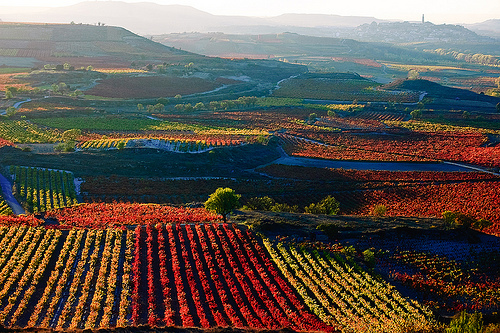 It demonstrates how important Spain is not only as a wine country, but Rioja as a thriving wine region. It also shows how appreciative we are to all the wineries who supported Catavino over the years: who had faith in us despite our use of “newfangled” media. And it celebrates all those people who supported Catavino from Day 1, who dedicated their time and efforts to reading about a small part of the world that means the world to us. With luck, we will help many more people to fall in love as quickly we did. We take great pride in the community of people who join us every year, which tend to be extremely open, innovative, creative and collaborative. And despite their many languages, coming from well over 30+ countries, there is always a desire to find a common language. Rest assured, you will always be welcome. If you’re a Spanish wine lover eager to dive into online communications, or simply a winery who is keen to glean a few online tricks, please come join us. Or if you are one of the many wineries who have supported Catavino in the past, please join us in Rioja. There are still sponsorship opportunities available, but they are going fast! For special deals on tickets, please contact us at: contact@catavino.net!